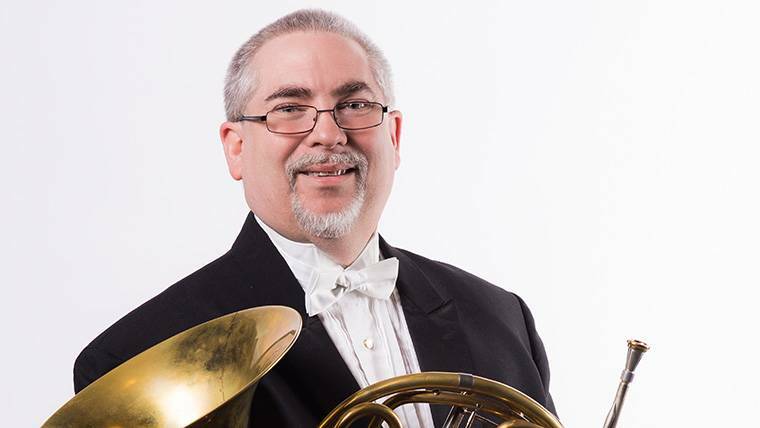 Originally from Fulton, MO, Andy Harris has played professionally with the Albany(GA) Symphony, The Savannah Symphony, The Fort Smith Symphony, The Arkansas Symphony, Des Moines Symphony, and Orchestra Iowa. Other orchestras Harris has played with include the Illinois Symphony and the Kansas City Symphony. Too many to really claim a favorite, but I always get excited when Carmina Burana comes around in the rotation. Such a big, boisterous work! Tchaikovsky Symphony No. 5 holds a big spot in every horn player’s heart as well. The next! Really, I try to let each experience be the next best memory. This art form is so fleeting in it’s product, it’s here now, then gone forever, that I don’t think you can live in the past. Every experience builds to the next. My mother’s sister was in college at Western Illinois. She was a horn player. One time while visiting my grandparents in Jacksonville, IL, she brought the horn home from school, put it on the piano bench, showed me how to make my lips “buzz”, and the love affair with the horn began. I was 5. I knew immediately what I wanted to do. I started collecting horn music and recording by the time I was 8, I think. In fourth grade, in Flint, MI, I got to start studying the horn with my first brass teacher in the schools. Unbelievable luck, the teacher, Ron Aaronson, was the principal horn in the Flint Symphony. In 5th grade we moved to Columbia, MO, where my next teacher for band was also a hornist, Virginia Hills, who had been a member of the Atlanta Symphony. What a great start! Horn wise-Dennis Brain first and foremost, then Randall Faust, W. Peter Kurau, David Bushouse, and the Berv Brothers. Music wise, I can’t give you an ordered list. Highlights would be: Leonard Bernstein, Peter Schickele, Danny Kaye, Red Skelton, Bobby McFerrin, Andres Segovia, The old NBC Symphony Orchestra under Toscanini, the Czech school of horn playing, Sugarloaf, The Blues Brothers, Rush, The Vienna Philharmonic, The NY Philharmonic under Bernstein, The St. Louis Symphony of the 1970-80 era, The New Lost City Ramblers, and many, many others. Maybe construction work or carpentry. I spent a summer in 1980 working with a company that was building a sewer line in SE Kansas. Had a great time. I also worked for a while with a custom cabinet maker. I can’t tell you how neat it was to actually finish a project and actually have something concrete that I could point to and say “I created that.” That’s something that, due to it’s ephemeral nature, music can never be. It never has permanence.